In 1926, the future King George VI, still merely the Duke of York and with no expectation of ever being King, found his lifelong stammer an increasing obstacle to his increasing public duties. With recommendations from friends, he sought the assistance of Lionel Logue, an Australian-born speech therapist who had emigrated to London with his family. The movie The King's Speech tells the story of their relationship from 1926 until 1939, when the King delivered the speech of the title, when Britain declared war on Germany. 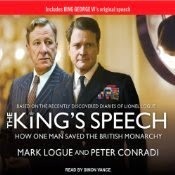 This book, in part a result of the movie and the interest sparked in Lionel's grandson Mark by the filmmaker's requests for information about his grandfather, has a wider scope, chronicling Logue's full life from his childhood in Australia, the world tour that ultimately led to the decision to move to Britain, and the relationship with George VI that, while reduced when the King no longer needed the active assistance of a speech therapist, continued through the remainder of the two men's lives. It's a fascinating look at both an improbable friendship in the very class-ridden British society of the first half of the 20th century, and the development of speech therapy as a recognized and serious part of the medical field. Also included is Mark's search for the papers, letters, and records of his grandfather, which is a tale in itself. It's an engaging story, and Simon Vance reads it well, making all the players distinct and interesting.